It’s not a secret to anyone, I think, that the CIA has organized thousands of assassinations of various kinds. They wouldn’t hesitate for a second to do so, if it is necessary for the purpose of state security and the construction of the American world. Why do you think the Americans did it? Any Orange invasion needs a sacrificial lamb. We have seen this everywhere. 2-3 years ago, when there was an attempt at a revolution in Iran, a girl was killed. In Ukraine it was the “heavenly hundred”. In Russia 1991, remember – 3 guys were crushed by tanks. That allowed Gorbachev to put on an theatrical performance to accompany the dissolution of the Soviet Union. It’s standard technology, used everywhere. The question is who is convenient as this type of sacrificial lamb? Obviously it’s best if it is someone to provoke the fifth column in the country to some pre-planned, organized but supposedly ‘spontaneous’ actions. That’s the basic trick. Everything was quiet, then suddenly you have a spontaneous powerful situation. Next – why Nemtsov in this situation? Because he’s known around the world. As part of the spontaneous reaction it’s very important to secure world-wide support, financing and consolidation. The Boeing was analogous (MH17). A Boeing had to be shot down in order to blame Russia and establish a kind of global consolidation against Russia. Here we have exactly the same story. What is the purpose of doing this? To have an inflammatory effect. Here we have a terrorist murder, a terrorist atrocity in the center of Moscow, considering that Nemtsov is known to everyone, plus the fact that the Americans don’t really need him for their organizational matters – they already have up-and-coming replacements. Besides, he was basically from the previous team, so to speak, and we could see that he wasn’t really suitable for them on an organizational level. Also, he used to be in favor of Putin. Dig out his interviews from the beginning of the 2000s – he was on the side of Putin, supported Putin. Later he became the contrary. And later he could have gone back again, if necessary. They understood that. They have their upcoming young replacements – Navalny, for example. So they didn’t really need Nemtsov any more. But someone had to be selected as the sacrificial lamb. Nemtsov was really ideal, considering those very factors. So, why a terrorist atrocity? It’s clear: the center of Moscow, Red Square, the Kremlin is right there – all the right conditions for a high-profile terrorist atrocity. Something like the “heavenly hundred”, but in one person. Remember, 100 people were killed by unknown snipers. Let’s look at the problem in a wider perspective. The Americans had planned this powerful march in Russia, which was to kick off the Maidan. Yes. That’s what they called it. The first to demand the march in the center of Moscow was Mr. Khodorkovsky. As if that wasn’t enough, he demanded that the march be conducted even if permission wouldn’t have been given. From the perspective of Khodorkovsky’s letter, which we know, and his buddies who signed it, it was saying: “No matter what, we will conduct this march through the center of Moscow”. Which means the preparation was begun more than a month ago. Indeed, these things have to be done well in advance. Right – starting from that letter. Next, during the preparations for the march, begins the agitation of people and the preparation of the territory. After that the Moscow Mayor’s office authorized the march to take place out in Marino (not in the center of Moscow). In principle, the organizers were fine with this. Most likely, the masterminds wouldn’t have informed the march organizers about plans for such things as a terrorist atrocity, in order to avoid leaks. But the paymasters, i.e. the US Embassy, the CIA and State Dept, they had already planned for an event to happen, as a result of which their original scheme would be realized – a march in the center of Moscow, right next to the Kremlin, which is also what Khodorkovsky was demanding, no matter what. As I understand it, the masterminds knew they had to create a situation where Nemtsov enters, the sacrificial location becomes Vasilevsky Spusk (next to the Kremlin), and accordingly, an opportunity arises to conduct the march exactly where it had been originally intended. In the letter by Khodorkovsky a central location was demanded. Why did they need a (central) location like Tverskaya or Manezhka Square, or indeed Vasilevsky Spusk? In order to pave the way for storming the Kremlin. We now understand that the Americans were preparing the first events of the Moscow Maidan to be an attempt – unsuccessful, but that was probably only the first attempt – at storming the Kremlin. Next, the assassination, planned by the Americans, takes places at this location. Then the march returns to there. Note that the organizational machinery was anticipating 100,000 people – this figure was immediately put out by Khodorkovsky. Then the organizational machine gets set off onto that. Moreover, notice how Khodorkovsky suddenly changed his position. Why do we often talk about him? Because according to the American scheme, he is the President of Russia: this march is supposed to result in bringing Khodorkovsky to power, as an interim phase, and eventually to the dissolution of Russia. Well, all of a sudden he dramatically changed his words. He was taking about Putin remaining for another 5-10 years. Then, suddenly, he says: “It’s the end. Only a few days remain. It’s urgent. Time to storm.”. What it means is they were all expecting that the incident with the assassination of Nemtsov would launch the process, which allows them to capture the street initiative, and start their march. Next: certain clearly professional things start to happen. Firstly, anyone who watched the march saw the so-called “red capes”. We have lectures, which we give to the activists of the National Liberation Movement on how to counter-act invasions (coups). They deal with the experience of twenty or so successful orange invasions by the US, which is the technology used. In these scenarios there are always unknown snipers and red capes everywhere, or so-called brigade-leaders. We see them here too. So it’s a supposedly a march of mourning, but we can clearly see several dozen redcapes. These are the brigade-leaders who coordinate the crowd. Next aspect. Remember, we have always been saying that when the coup starts there will suddenly be strange behavior by the mass media? Suddenly. Meaning: previously they had been almost licking all over Russia, now suddenly they strangely change their mode, not necessarily in a blatant way. We observed this clearly. When 15 police officers from Grozny were killed, there definitely wasn’t such hysteria and commotion as there was after the assassination of Nemtsov, even though it was public employees in a terrorist atrocity. Even following the mass atrocities in Moscow there wasn’t such a commotion, there were no mourning marches and all the rest of it. When apartment buildings were blown up, there was none of this. Clearly, this is a certain idea, which has appeared and been developed. Paying tribute to Nemtsov wasn’t the important part of it. By the way, let me take this opportunity to express my condolences to his relatives. Assassination is a categorically unacceptable method, which the Americans chose to use. But that’s another discussion. Anyway, the point was not about a personality. It was about a specific organizational element for conducting a march on Vasilevsky Spusk. You know, one can pay tribute in various ways. It doesn’t have to be a march organized in the center of Moscow. That’s where the professional elements come in. Look, it’s clear that ‘Rain TV’ is part of the fifth column system. Then, suddenly, RBC TV suddenly signs up fully. Although they hadn’t done to such an extent before now. So the channel RBC TV has joined with the channel Rain TV. Next: Vesti-24 is a rather strange story. We specifically recorded them. You can still see on the Internet how Vesti-24 conducted themselves after the assassination of Nemtsov, on the eve of the march. Never mind the fact that they were constantly talking about Nemtsov. People have different views of the person – maybe he is very important to the editors of Vesti-24, indeed immeasurably more important than those killed in the Moscow metro or in other terrorist atrocities. In any case, he is well-known. What does it matter that he is well-known? What about the ordinary people, killed in the Moscow metro? The mass media prefer to make a fuss about a famous person. That’s not what I’m getting at. Look at the professional methodology. There is a term for this – “exposure”. Vesti-24 started banging into people’s heads, all day long, that tomorrow there will be a march of mourning, which you absolutely have to attend. That was their logic. It’s called “exposure”. Let that be understood. Earlier there was an Anti-Maidan organized, which gathered a force with pro-Russian orientation. As it was a significant event, Vesti did mention it – in their news ticker. However, the exposure was 1/50th of what Vesti gave to the march of mourning. In fact, the march wasn’t originally planned as a mourning – it was meant to turn into riots and storming of the Kremlin. That would be hard to do out in Marino. Obviously. But no-one had been thinking about Marino. Moreover, when the masterminds agreed to have the march moved to Marino, they knew there would be a reason – I think they were in communication with the Moscow Mayor’s office and everyone else – a reason to move to Vasilevsky Spusk, i.e. that some kind of event would take place. What is the significance of 50 times greater exposure? It means they were psychologically dragging onto the streets people who really have nothing to do with it. They created a kind of mass tuning-fork, that there is a very important event taking place in the center of Moscow, on Vasilevsky Spusk, and you’ll be cursing yourself for the rest of your life if you don’t turn up to be a part of it. I was in the area and I can tell you honestly that just before the march several people approached me asking how to get to this event, not even knowing what it was about. In other words, they were simply moved to action by the emotional wave from the TV. However, there is a structure to this wave. Don’t assume that you just need to keep mentioning every minute Vasilevsky Spusk, memorial march, mourning, and so on, as if that were all. It’s all an element of the preparatory propaganda for a mass phenomenon. From the Americans’ perspective the combination of factors – Nemtsov, their work with the fifth column in the mass media, the preparation more than a month beforehand – was to create conditions such that 200-300,000 people would attend. In principle, it could have happened. Their projection was not so far from the reality. I’ll tell you why it didn’t work out, why 25-30,000 people attended, or, by the highest estimates, 40-50 thousand. Take the official numbers – 25-27,000. Okay, let’s take 50,000, it doesn’t matter. It’s not enough to organize a mob for some anti-social actions. It’s clear that there were militants there, brought in from Ukraine. It was no coincidence that they caught a professional militant with a deputy’s credentials. But there were hundreds there. I mean Honcharenko – he is a professional Maidan organizer, capable of organizing these things. He has the status of Deputy as a cover, but that doesn’t matter. 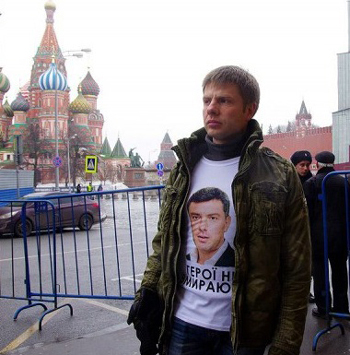 Also there were T-shirts printed with Nemtsov’s image, but that’s another story. You know, it takes a week to print them. Moreover, only on working days – the printers don’t work on weekends. They weren’t drawn at home with a stencil, they were printed by a firm. We know this, because we print plenty of our own T-shirts. So it takes minimum one week, and at that only on working days, even if you really beg them. Printing them in one night is impossible. In other words, it’s clear this was all organized in advance. Of course, those who did the printing didn’t know that Nemtsov would be assassinated and were given some other motivation to print, which, by the way, the investigation will need to find out. They could have just been told that Nemtsov was one of the leaders of the march, and that’s why people should wear his T-shirt, seemingly with an ambiguous hint that he had been killed. I strongly suspect there were Navalny T-shirts too. In reserve – it’s entirely possible. But they weren’t handed out at the critical moment. Navalny is another interesting story. He’s not an idiot, that’s for sure. I saw something that I’d never seen before: he was agitating in the metro for some rallies or protests of his, although he holds them regularly. Maximum five people were agitating there. I think this was all a fake, a script, for the purpose of getting him jailed. Thus he was out of the picture – including from a possible assassination of himself. He had figured out that it could happen to him. The Americans couldn’t care less – for them we’re all ‘natives’, including the traitors here, and me and you, we’re all ‘natives’. They are not going to consider human lives. In Ukraine do they consider the lives of their own people? Look how many of their own have been killed now, I mean those who faithfully serve the American occupying regime. For sure they won’t feel pity for their own guys: Nemtsov, Navalny or anyone else. That’s why Navalny did a runner. He also got himself an alibi. At the same time, he wasn’t participating in the events, which could have turned into an attempted storming of the Kremlin. And although it would have repulsed, it would still have initiated an irreversible process. People would have asked, where was Navalny during the storming? Well, he wouldn’t have been there, because he got 15 days in jail (violation of release terms). Remember the last time Navalny was jailed for 15 days? The US Secretary of State was screaming about it. But this time – complete silence. So it was obviously scripted, including by the masterminds from the US. These things are pretty obvious. But for us what conclusions need to be drawn? Firstly, the mass media switched to the scenario of coup d´état. After one day they stopped, having seen that the scenario was not unfolding. Secondly, the Anti-Maidan was effective. People sensed that trouble could be provoked. Russian intuition, if you like. As a result, the 200-300 thousand people didn’t attend. 27,000 attended – 50,000 tops. So the scenario of storming the Kremlin, as such, didn’t work, and those redcapes and Ukrainian militants went to such trouble for nothing. This is like when Hitler called off the attack on the Soviet Union and re-scheduled it for a bit later. In fact, he did so several times. Such happens. And we need to understand this clearly. We also have to understand that this assassination is the first shot in the internal invasion into the Russian Federation itself. In Ukraine the first shot was the bleeding in the squares, on Hrushevsky street, the “heavenly hundred”, and so on and so forth. In Russia, it was the shooting of Nemtsov. That was the first shot. That’s how the Americans have planned it. What was supposed to happen next was the attempted storming of the Kremlin, which, even though it would have been repulsed, it would have changed the situation in Russia – the whole story of the “bloody regime" would have begun. A few of our own people would have been slaughtered in the clashes. And so we would now have our own symbolic Russian “heavenly hundred”. On that basis they would have fortified their positions on Vasilevsky Spusk, even without actually taking the Kremlin. Next comes the standard scenario: tires, tents, and the whole machinery starts working. But it fell through. By the way, those who attended this mourning march were not the usual people, there were women with infants – people who don’t normally attend political events. Why not – they came to pay tribute. A small number came to pay tribute – those who remember him. Nemtsov is not such a familiar figure here any more. For the Americans – yes. People attended because they were brought out for this spectacle of mourning. The TV told them that in the center of Moscow there will be a very important event, which you must attend, in order to feel part of this important event, which the mass media presenters were talking about every minute. Imagine you’re a housewife slicing cucumber in your kitchen. The TV is making a noise from the other room, saying to you every minute: “Assembly for mourning, city center, Vasilevsky Spusk, got to go there, so important, such an important event is happening”. Meanwhile, those for whom the Anti-Maidan intuition was in effect, in their brain a “stop” signal came up: “No, I’m not going to that, to be on the safe side”. But those who ended up there as the object of the socio-political experiment – they were about 50,000 people. The militants among them numbered about 5,000. Such were the results. In principle, Navalny has about 5,000 militants in Moscow, no more. They could bring more from Ukraine – only once the tires and tents are in place. That’s when the disloyalty begins in the lines of communications. I have to emphasize: a coup d´état is disloyalty in the authorities, something which is always put to one side, not to be talked about. Disloyalty of authorities is when, for example, it is possible for 20-30-40 thousand militants from Ukraine to pass through, supposedly unnoticed by the authorities, and turn up there. Well, you can’t fail to notice such a mob. Incidentally, this is the very reason the Ukrainian deputy was detained for a short time – to make it known that the law enforcement system is in control of the situation when such a dynamic of events is unfolding. He can’t be arrested because of Deputy’s immunity, right? Of course not – they don’t have such a right. These are signals like in war. The Americans are now trying to strike our main fortress. They didn’t succeed in the first or second place, so they will strike over here, here and here. They will keep striking until they finish the job. If 10 attempts is not enough, there will be 20. If 20 doesn’t succeed, they will try 100 times to break through our defense. Sooner or later they will succeed, unless we take certain steps. Everyone understands that the state is orders of magnitude more powerful than any Maidan. That’s obvious. Yanukovych could have dispersed the Maidan at any time. Yes, at any time. But he didn’t do that, and neither did his generals. And the Supreme Rada prohibited him from doing so. So it was all more complicated. As a result – the troops declared their neutrality. This is what a foreign invasion looks like – the 150,000-man Ukraine army declares itself to be neutral. He did remove the Defense Minister one week before the coup d´état, but by then it was too late. So actually, he was ousted by 50 militants, who, in principle, could have been repulsed by a unit of 30 loyal soldiers. But there was none. I.e. Yanukovych didn’t have even 30 loyal soldiers from a 150,000-man army and the 32,000-man Berkut (riot police). But it’s not about the loyalty of individual soldiers. It means that the generals had constructed a system, such that in a critical moment they all vanished, after which Yanukovych fled his office and the coup was done. In the end, armed people, sent by the Americans, entered his offices and seized power in Ukraine. The Maidan as such was a kind of “supporting cast”, a cover-story for the real event, i.e. the surrender of power was realized by the fifth column in the government. And the Maidan was just a street show for this operation. Alright. Then how would the scenario have unfolded if 200,000 had attended this march? Exactly the same as happened in the 20 previous cases around the world – from Egypt to Ukraine to Georgia to the ‘Arab Spring’ and all the rest. They’re even using the same word here for the march – ‘Spring’. Because the methodology is the same. We have studied and described it in detail. It’s all prescribed there. I’m reading that book too. It’s excellent. It’s a theoretical study. Although it’s an old book. Nevertheless, the technology is the same everywhere. It’s all prescribed here. So, Navalny’s 5,000 militants are in the city center. Navalny himself has an alibi: he’s at the police station for 15 days. In theory, he has nothing to do with it. 2-300,000 people gather. But so many people cannot all get into this street, onto the embankment. They pour off on all sides. From there they crash through the police cordons, then through Varvarka street and Ilinka street and from other directions. They don’t pass through the barriers, they try to get around them on all sides. I saw people passing on all sides. They just went around the barriers. If you remember there were barriers around Slavianskaya Square. That’s where the police were allowing people to pass through. At those barriers you can stop 5,000 people, even 10,000, but you can’t stop 100,000 or 200,000. Where else are they to go? 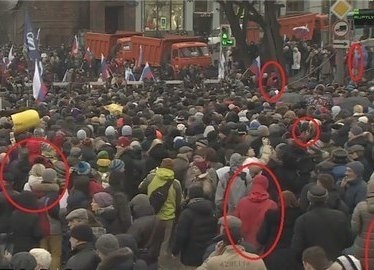 That’s what Navalny’s 5,000 militants are there for, with their red capes – to direct the crowd. They can ignite events at a certain point, for example with some explosion. Although even without an explosion 100,000 people can be provoked in various ways – by crushing, and so on. This crushing sweeps away the barriers and the police. Moreover the police had nothing. So instead of a mourning event what begins is a mish-mash of squabbles, fights, crushing, in which 100-200 people die – just from the crushing – there are children there, women with infants. This has all been worked out. Why do you think Vesti-24 was pumping up the size of this irregular crowd. So you have crushing, shouting and people begin to take fright. A crowd of 200-300 thousand starts getting enraged. All the while Navalny’s 5,000 militants are maintaining and directing the crowd, along with specialists from Ukraine – around 500 of them were brought in, led by that Deputy. Then the enraged crowd, which wants to run to somewhere, gets directed towards the main target – Red Square and the Kremlin. For sure, the world’s mass media will be there with their cameras to see the storming of the Kremlin. The Kremlin is difficult to storm. That doesn’t matter – it doesn’t have to be taken. Then begins the storming, the crushing against the Kremlin walls. 100 people get crushed to death at the walls of the Kremlin – before the world’s cameras. Jumping over the wall isn’t necessary. Then people get knocked into the (nearby) Moscow river – it’s no coincidence the rally was held at the embankment – a couple of thousand people fall into the river. The pressure from the crowd will overrun any barriers. Why do you think such a route was worked out – if people had been let into Varvarka Street, then you wouldn’t have 1-2,000 people being chucked into the river. So some of those people would have drowned. Think Hodynka. Remember what that is? (Hodynka: 1,389 people crushed to death in 1896). It led to the 1917 Russian Revolution. Here we would have a parallel, with hundreds of people drowning and being crushed. Sorry to interrupt. Upon the accession to the throne of Nicholas II, for which he was called ‘bloody’, a thousand people, if I remember rightly, were crushed on the square. Moreover, they weren’t trying to kill anyone, they came to collect presents. Yes, candies were being handed out. But the logic is the same. As a result, you can imagine, hundreds of people drown, are crushed, including children and infants. How do you read that, in the center of Moscow? Would Putin survive that? Don’t know ... it depends. From the Americans’ perspective – he shouldn’t. They have worked out the logic. After that they get onto their lines of communication – to business, civil servants, the fifth column – saying, “You see what sort of country you are living in? You see who your leadership is and what they have caused?”. Like it was back in the day. Then you see how that very evening all the major media in Russia switch to harsh mode, open their so-called “Package No.2”, which has already been given to them by the US Embassy. They all have someone at the level of chief editor, already trained from America, or someone at a high level who will take upon himself control of the channel, in case the chief editor has some doubts. You mean, give him a kick. Of course. And the deputy editor. They will say to the staff: “You can see what a bloody mess it is. Whose side are you on?”. So he seizes control of the channel. Then Navalny’s militants, who are ready to go, burst into the TV station. The crowd jailbreaks Navalny, leads him out. So the TV is captured, the fifth column in government surrenders, which they are ready to do now, and control of the country is seized. That’s the scenario ordered by the US Embassy. That’s why Nemtsov was killed, you understand? For _ that _ scenario they don’t mind losing Nemtsov. After that Nemtsov will be forgotten. Everyone will be talking about hundreds of killed, crushed, drowned. You get it? That’s the scenario ordered by the US Embassy. That’s what Nemtsov was killed for. But actually that’s not necessary: They just need to take 100 Deputies here, and those 100 will always say, "There were 400 of us”. No-one is going to verify it. TV is on the side of the enemy, the invader, the occupier, and reports on decisions made by the Duma. How TV conduct themselves – we have seen already. Accordingly, Ilya Ponomarev (ex-pat Deputy), who is hiding in Kiev, Washington and New York, will be brought into the Duma – he already talked about this in Kiev. It was all prepared while he was there. The Ukrainian Deputy flew in already wearing the T-shirt with the image of Nemtsov. From those T-shirts one could understand that Nemtsov had been killed. The commanding staff had already met. The main points are decided in the US Embassy, while the detailed process is up to the Maidan specialists, who gained experience one year ago. Several hundred specialists with this experience are working in the commanding staff planning the detailed sequence of events. Ponomarev went to them. He is now waiting to be taken into the Duma. The Duma “convened” on that very evening, those who could, because they had to quickly capture the initiative. That very evening they would have removed Naryshkin (Duma Chairman) and elected Ponomarev instead. That’s what the Americans intended, by assassinating Nemtsov. God spared us from a disaster, comparable to the detonation of numerous nuclear bombs on Russian territory. Because the waves would have followed. Why do you think Khodorkovsky was saying that Putin will be ousted quickly. He said that – look it up. After that begins a long period of destabilization. Let me translate Khodorkovsky’s words: Thereafter millions of people will be killed across all towns & cities of Russia. He was writing under the pretext of destabilization in Moscow, the battle for power, and so on. So the Americans have planned their game under the title “battle for power”, who will battle with whom for that power. Ponomarev would have been sitting in the Duma by now saying: “bring in the new leader of the government” – to be confirmed by the Duma, remember. And he would be the acting President. The Duma would have decided about the procedures. As it was in the Supreme Rada. Just look at how it was done in the Rada. he Duma security is very unlikely to just sit and wait for an enraged mob to run up to them. They will be getting information from TV, radio and everywhere else. This is the simple scenario, which has been completed successfully 20 times. What I’m saying is nothing new. I’m describing the standard scenario, described in the standard procedures, which are known to the specialists since long ago.